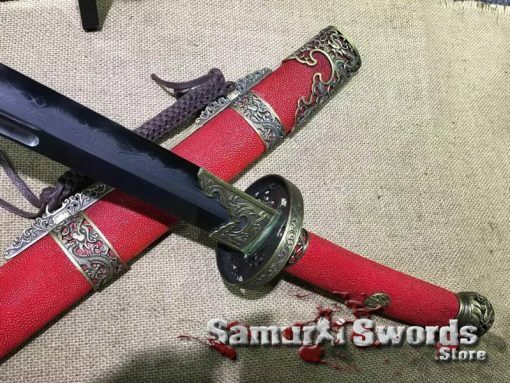 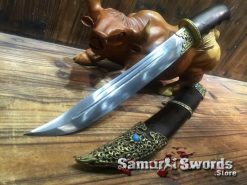 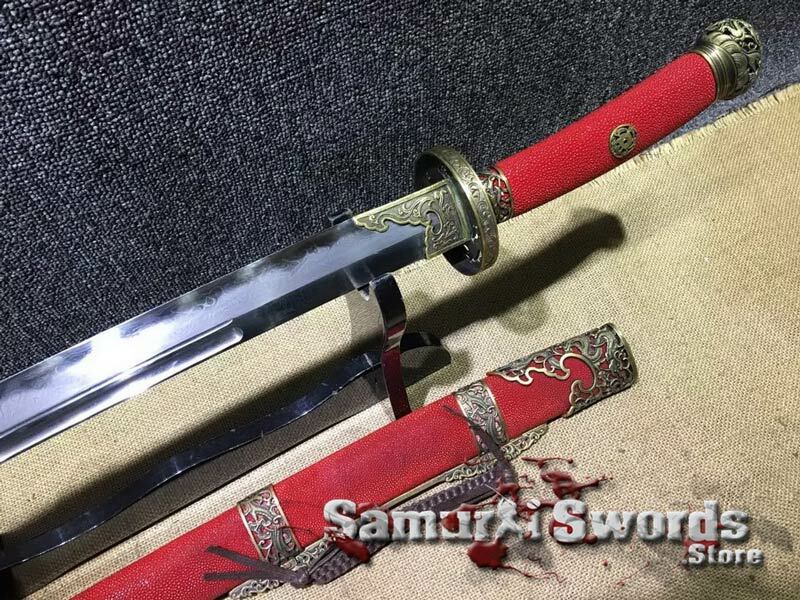 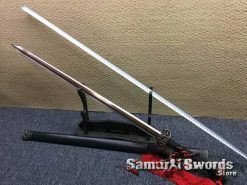 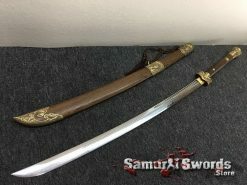 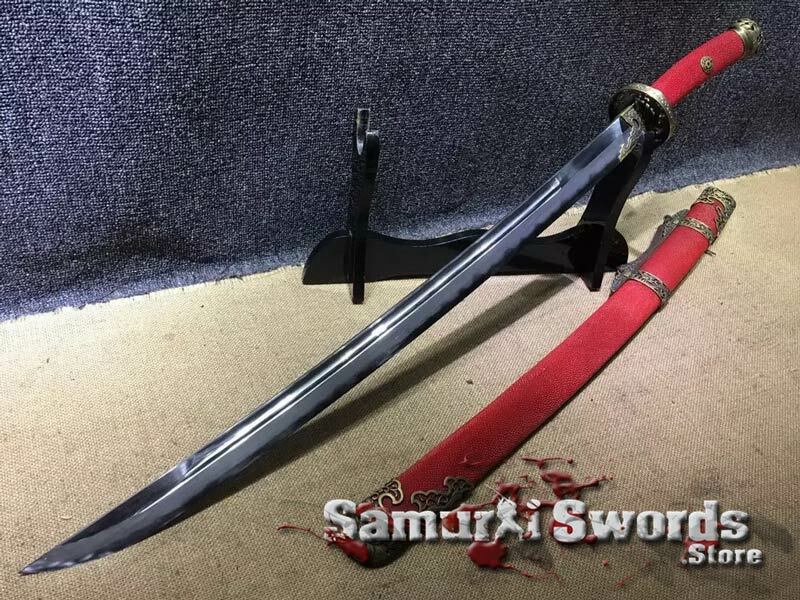 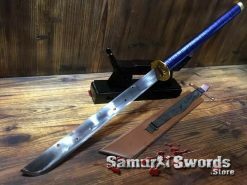 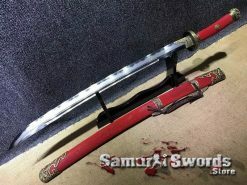 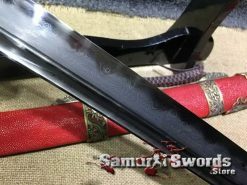 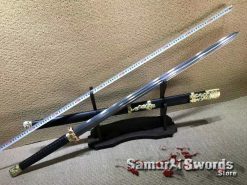 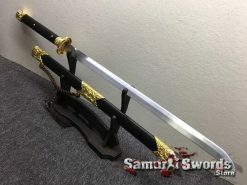 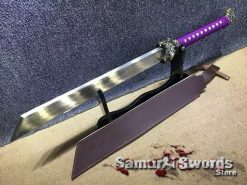 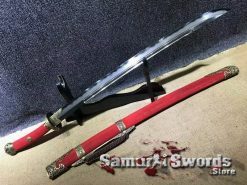 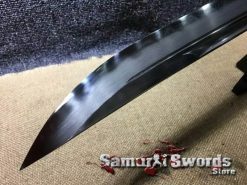 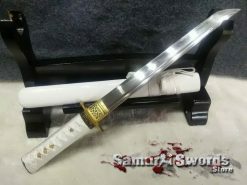 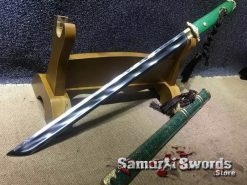 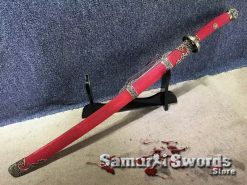 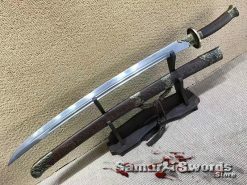 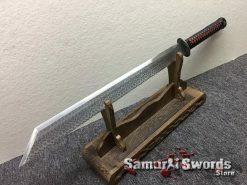 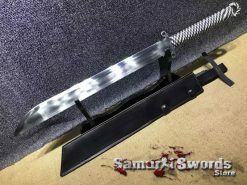 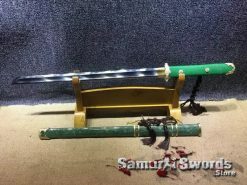 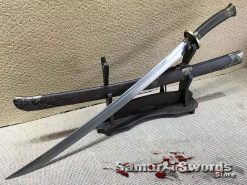 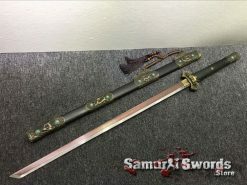 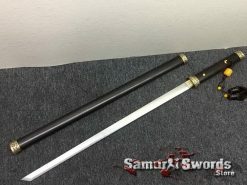 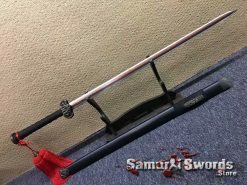 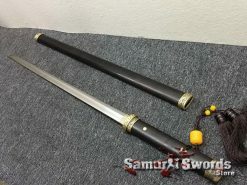 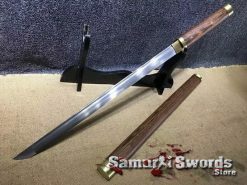 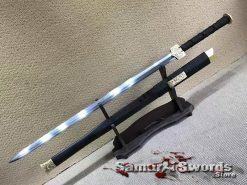 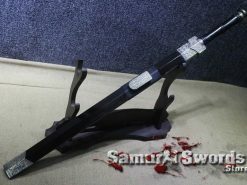 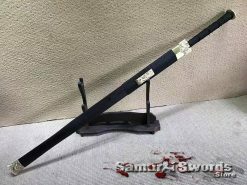 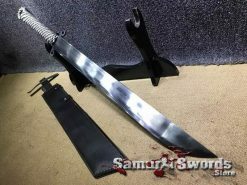 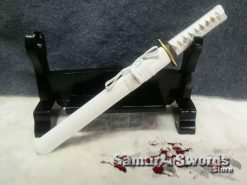 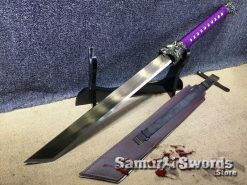 The Heavenly Red tianhongdao sword is a gracefully curved Chinese saber with a folded blade formed from T10 folded clay tempered steel and polished in Hadori method. 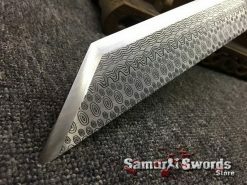 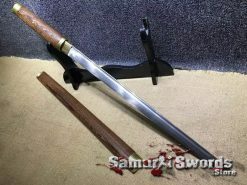 It is this folding technique that has given the sword a flowing, wood-grain pattern that is vibrantly visible on the blade. 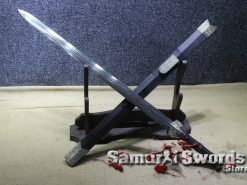 The process of folding steel in this manner in China is a technique stretching well into Chinese antiquity and Chinese weapons craftsmanship was revered by the Japanese in the Tang dynasty. 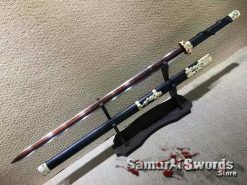 Many enterprising Chinese and Korean swordsmiths relocated to Japan in this time and in time this transmitted their knowledge of swordsmithing to the Japanese. 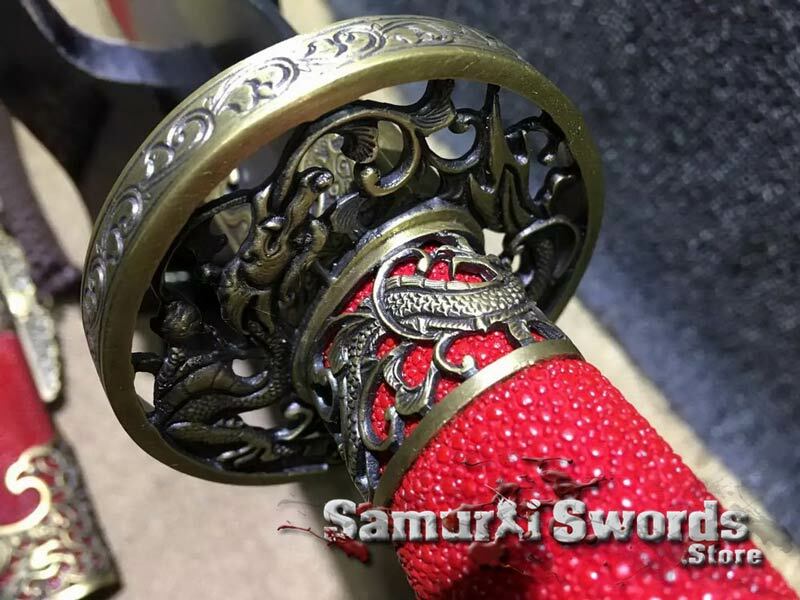 The guard, pommel and dragon-head blade collar are of hard quality copper and the wooden grip is wrapped in authentic rayskin and secured by a copper pin. 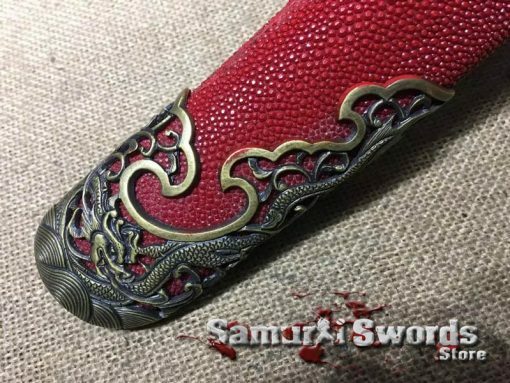 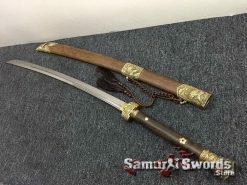 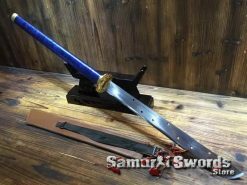 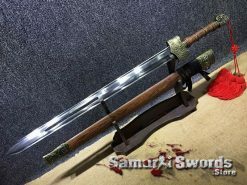 The sword is accompanied with a wooden scabbard covered with authentic full red rayskin with copper fittings and a hanging cord. 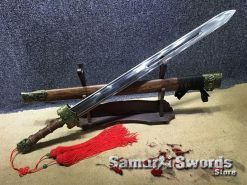 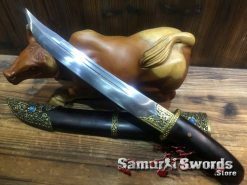 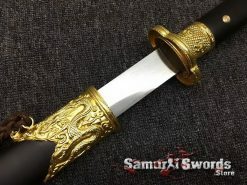 The form of the Chinese tianhongdao seems to have originated with the sabers used by the Mongol horsemen – the sword is optimized for quick slashes and cuts – the reverse curve of the grip allows for the palm of the back of the hand to aid in powering the sword through the cut. 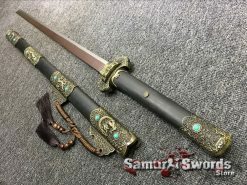 A Tianhongdao was the chosen weapon of Qi Jiguang – the famous Chinese general who circumvented the corruption of the Chinese state to drive the Japanese pirates from their forts on the coast and into the sea from whence they came.